Currently, 60% of individuals use the internet more than 5 times a day, with 91% saying that Facebook was their preferred social media platform. These statistics show that the online community is a vital area companies should be taking advantage of to reach consumers. Social media’s main purpose is to connect people. When businesses use social media, not only are they able to connect with their audience, their audience is able to grow. In the Yellow Social Media Report 2018, over 50% of consumers highlighted saying that they are more likely to trust a brand if their social media is up to date, engaging and interact regularly with their customers through various online platforms. Not only will businesses be able to grow their platform, they will also be able to monitor their competitors. It is important for brands to be aware of what their competitors are offering and working towards. If businesses are not silently following their competitors, it would be easy for brands to become unaware of what they are really competing against and potentially fall out of the competition. For a business to optimise online spaces, it is important that they begin with a clear and concise image of how their brand is going to look on each platform, and how to play to each platform’s strengths. Each platform appeals to a different audience through its algorithms, features, usability and overall attraction. Businesses should consider the demographic they are trying to target and then decide which platforms will be beneficial for reaching their desired audience. In saying this, businesses should not fall into the trap of using only one platform. Although each platform has a particular demographic, this is only a majority of the individuals who use the platform. The smaller portion should not be ignored. Once you have decided which platforms you want to use to enhance your business, you should begin to understand the basics of each platform’s algorithm. It is one thing to post on social media, but it is another thing to post effectively. For platforms such as Facebook, who work to make family and friend posts priority rather than business posts, it would be useless to post ‘normally’. These factors must be taken into account in order for posts to be seen and recognised. This information will give businesses an overall view of their audience, how well their content is performing and what content has received the most traction. With all this information, how does a brand make their followers interact with their brand offline in terms of sales and creating profit? Social media should be used as an extension of an offline brand. It should be used to compliment and reach a wider audience, but not take away from their offline aspect. Brands and businesses should not be afraid to post information about their offline space in their online space as this will create a cohesive relationship between their social media following and their physical business. Following the number of great insights from day one of #MayoInOz Healthcare and Social Media Summit 2015 yesterday, I was delighted to learn just as much on day two. It’s impossible to expect somebody who fulfills a full time job to carry out the additional roles of a social media manager. Simon Trilsbach from Hootsuite highlighted the importance of social media responsibilities being too important to leave to an intern. Today, social media is imperative to an organisations sales department, human resources, marketing, customer care and even an organisation’s CEO. It’s about creating meaningful relationships. You want someone you truly trust who understands your company values and ethics who can uphold them across a range of social platforms. Give someone the responsibility to actively listen and understand the sentiment of what people are saying about your organisation. Social media should sit alongside your other marketing tools and complement them. It is too important to leave to one person, let alone the intern. The key for getting social media to work for your brand is knowing your brand voice. Marketing and Digital Strategy Manager, Epworth HealthCare, Kristina Garla, suggested that organisations should identify their character archetype to help find and balance their brand voice. Each archetype will differ depending on the social media platform you occupy. Your brand shouldn’t talk at people. A great way to get around seeming patronising as a brand is to adopt the storyteller approach. Be brave with your brand voice and take on different voices, as the archetype approach allows. The afternoon sessions by Jen Morris, Russell McGowan, and Deborah Warrington-Love, demonstrated the strength of emotive online communities. The influence of like-minded people sharing their patient journeys, questions, and concerns can hold immense force. A big part of intersecting patient-doctor life lies in reciprocal didactic communication. There needs to be open dialogue between the patients and practitioners, with a willingness to improve consumer control. Heathcare organisations have the responsibility to look and find these communities where patients are sharing their journeys on various platforms including crowd sourcing research forums and online groups. The strength of social media campaigns was highlighted through the story of Deborah Warrington-Love’s son James. Rare Cancers Australia syndicated the story of James Warrington-Love on social media, resulting in national news coverage and fundraising for the family. Whether healthcare organisations like it or not, patient conversations and campaigns are happening in online spaces. They should not be ignored, and where possible, encouraged to collaborate. It’s important for healthcare organisations and clinicians to realise that medical advertising guidelines extend to social media. How and why AHPRA regulate social media for practitioners in the digital space in Australia must be understood. Healthcare organisations need to be aware of the possible breaches they could be making by leaving a positive review up or possibly even a LinkedIn endorsement. A large part of AHPRA policies and guidelines, including the Codes of conduct for each national board, Social media policy, and Guidelines for advertising regulated health services, mean nothing without a thorough understanding. Education must always be a part of policy regulation. A policy is redundant without the knowledge that a) it exists and b) an understanding of its ins and outs. The use of video and other forms of content to communicate these policies to staff can be pivotal (see the Ramsay Health Care Social Media Policy below). Organisations need to familiarise themselves with their relevant guides. 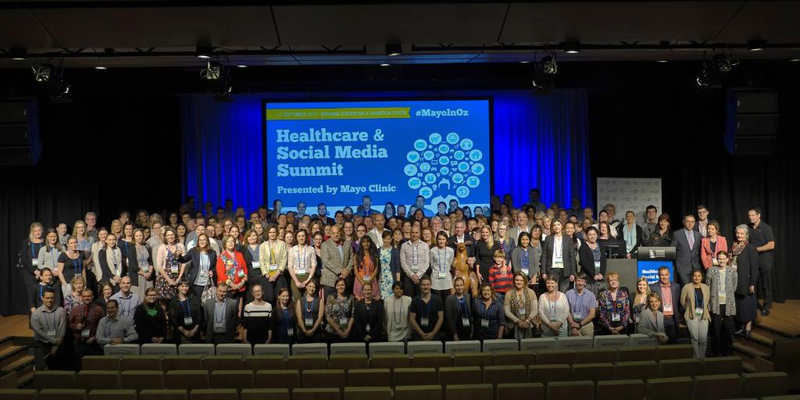 Thank-you to all who spoke, participated, and helped with the #MayoInOz Healthcare and Social Media Summit 2015. Be sure to follow @KamberCo on Twitter for more updates on our latest projects, muses, and #PlatformFive updates. SEO strategy development largely falls into step three of the process – Right promotion – but it needs to be considered throughout as well. Assuming the master SEO strategy has been completed (featuring keywords and guidelines for use), the next step involves activating a framework for on page optimisation. For brands hoping to progress from active to the maturing phase of the content marketing lifecycle, a content marketing strategy must include and be integrated with an SEO keyword strategy. Editorial guidance for on page optimisation informs best practise and ensures that content has the best chance of being discovered in search engines and therefore driving organic traffic to your website. What is the goal of this page – what are you ultimately trying to get your audience to do? Which audience segment is this page targeting? What are the primary key messages that you want to communicate? Consider keeping this to just three. What are the keywords and phrases that you need to include for SEO (as outlined within your SEO strategy)? Page Headline / Title. This is your <h1>. Is it clear and catchy, include primary keyword/phrase at the start, if possible. Between 40-70 characters is optimum)? What is the one key thing you want your reader to understand once they have read the first paragraph? This should be captured in the first couple of sentences followed by a summary of supporting points throughout the remainder of the page. Bolded Sub-Headline. This is your <h2>. Can I summarise the first main point discussed in the following paragraph, and included keyword/phrase if possible? Then look to back up your main message with a supporting point. You may wish to use bullet points to focus on special features or list further considerations. Bolded Sub-Headline. Use another <h2>. How do I outline the second key point/message in the paragraph below? This should include a keyword where possible. As before, back up your second key point with bullets, a list or maybe even steps to be taken to action this point. Bolded Sub-Headline. The third and final time you’ll use a <h2>. How do I outline the third main point discussed in the next paragraph? Of course include a keyword. Back this up with a supporting point. Have I provoked the reader with clear direction on what you want them to do next? Is it to download something from your page, click through to e-commerce, or visit a partner website? Images must add visual context to the copy you’ve written. It’s best to select these after you’ve written your copy. Have I used an appropriate and descriptive Alt tag? Alt tags should be used (for those visually impaired) and include agreed SEO keywords e.g. “steak recipe image for mushroom sauce recipe page”. Explain what the image is for and what page it’s on. Is the image the right size? Image can heavily impact site loading times. The faster the site, the easier it is for someone to visit and of course for Google to index. If you have a large image but you’re only displaying it at 200 x 100 pixels, you should consider reducing the resolution. ImageOptim is a great source for this. Is the page content 300 to 500 words? Is the headline clear, punchy and catchy? Does the keyword appear in the first paragraph of the copy? Does the post include any outbound links? Have you used short sentences and paragraphs and broken up paragraphs with sub headlines? Is this piece of content relevant to your target audience/segment? Does it address at least one of their problems and inspire them to take acrion? Have you stated your main point in the first couple sentences – this helps you set the tone throughout? Is your content low on industry jargon and easy to read? -Is there an article heading? -Is there a page title? Does the URL include page keyword and URL isn’t too long and free of underscores? Does the page include relevant tags? Ultimately, does the content pass the ‘so what’ test? Does it provide value to the reader? If not, you should consider revisiting. Remember, Google rewards websites for treating people as humans rather than cramming the pages with relevant keywords, so endeavour to get the balance right.